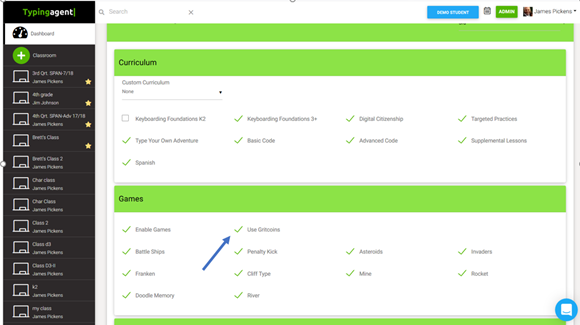 Gamification = increased learning and that is why Typing Agent is all about keyboarding and technology gamification for students! 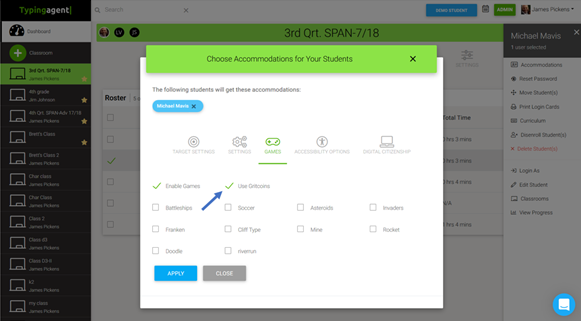 Since the release of our new version TA 5, we have heard from many of our teachers how much they loved having their students be able to use the Gritcoins they earn for completing their lessons for game time. We have listened and so it is without hesitation and with great excitement that we announce the reintroduction of Gritcoins for game time in TA 5. Both Administrators and Teachers are at the controls and can turn on and off a setting that allows students to use their Gritcoins to purchase game time in our typing game arcade. Each Gritcoin is worth 1 minute of game time and Gritcoins can be purchased in 10 minute increments.